For a manufacturer, the ERP software they run is central to their planning and operations. It is literally the heart of the entire organization. But over the years, as the organization grows, their ERP lags behind in terms of supporting their business requirements, flexibility, integration with latest technology etc. The symptoms start to emerge and that is when the enterprise has to start looking for an alternate solution. An upgrade maybe (If available), or move to a completely new and latest ERP software. But it is easier said than done. It is equivalent to removing an old wheel of your vehicle and replacing it with a new one while it is in motion. The organization has to start from the scratch, going through the latest ERP software from different service providers, evaluating the best one to buy, planning the implementation, restructuring the organization to suit the implementation plan etc. In short, it is a recap of the entire process that will cost the organization, lot of time, money and operational disruption. So, is it the right decision to replace your ERP system? Should you actually go for it? First, lets go through the symptoms that indicate your ERP is slowing down your enterprise. Means, your ERP has not kept up with the growth of your organization. As your organization grew, it needed more functionality to support its growth and your ERP simply lacked them. New workflows and business processes were added and existing ones were changed over a period of time but there was no way the ERP could directly support it. You had to manage them using external systems or through a workaround. Your personnel faced extreme slowness in response time or constant breakdowns in the system thereby derailing your day to day operations. This resulted in subsequent delay in order fulfillment and customer dissatisfaction. In short, it no longer met your business needs and slowed down the efficiency of the organization. Legacy ERP systems often lack real-time visibility that latest ERPs provide and that is the most critical aspect that a manufacturer needs. Order management, inventory tracking, product trace-ability, shop floor operations, material procurement, product shipping etc. all require real-time tracking in order to ensure smooth operations and order fulfillment. If your existing ERP doesn’t provide real-time information, you need to replace your ERP right away. For it not only creates enormous confusion within your organization but slows down your growth. Also, data errors creep in owing to old technology that is not in sync with the latest ones leading to breakdowns and delays. 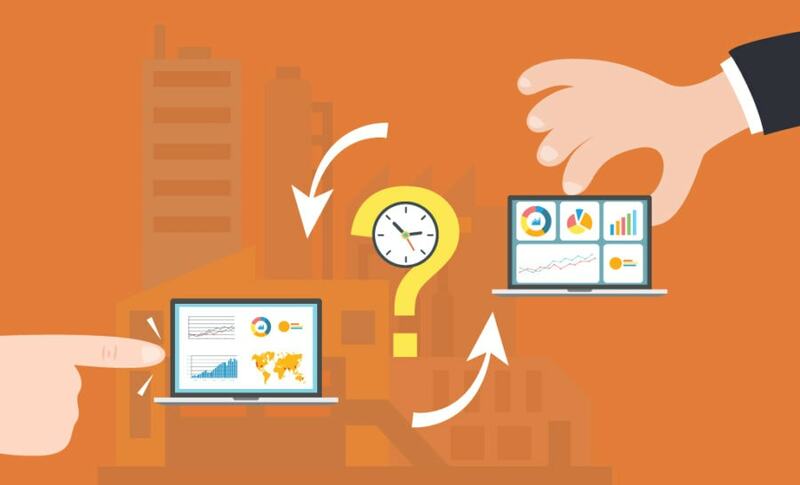 Lack of dashboards and business intelligence is another major issue as plant managers, supervisors and senior management executives rely on these tools to forecast sales, production and business growth. You have planned to overhaul your shop floor with the latest machine monitoring technology, nesting platforms & CNC machines and also plan to integrate your sales management with e-commerce platform. But you just realized that your existing ERP isn’t directly compatible with these technologies. Rather, you would have to spend on third-party integrating technology that will integrate these with your ERP, thereby significantly adding to your overhead costs. Also, compatibility with hand-held devices (mobile, tablets etc. ), bar-code technology, printers, scanners etc. is a must-have feature within an ERP. If you have ticked all the boxes here, then you need to upgrade to a latest ERP that fits your requirements. When employees find it difficult to work with existing systems, they turn to the ones that help them work better even if it takes quite an amount of time. Once your existing ERP make things difficult for them, they turn to Spreadsheets and other stand-alone third-party software. When this happens, its time to look into your ERP and mull changing it. If your existing ERP acts like a vintage automobile that needs frequent maintenance and overhaul, then it is time to replace your ERP. The symptoms usually involve something or the other breaking down within the system either due to system incompatibility or database issues. Any issue that needs repair would involve calling up the ERP vendor and making them fix the issue, which adds to the overhead costs, loss of precious production time and revenue loss. The manufacturing industry is fiercely competitive and you can outpace your competitors by quickly responding to customer orders, timely preparation of quotations, and cost estimates. For this, you need to retrieve various information such as product & component pricing, inventory availability, personnel & machine availability, current production schedule etc. instantaneously. If you are unable to carry out these activities in order to outperform your competitors, owing to severe limitations within your ERP, it is time to replace it. If you find your products not complying to critical benchmarks and industry regulations at an alarmingly high frequency, you need to take a look at your ERP. Non-compliance usually leads to stringent penalties and even revoking of manufacturing license in addition to loss of reputation and business. To avoid this, you need to upgrade to a new ERP that supports compliance regulations and benchmarks of almost all manufacturing industries in addition to a robust quality management module. Is it really your ERP’s fault? No. You might feel putting the blame on your existing ERP but that is not the right thing to do. Technology evolves almost every hour and what is deemed advanced technology today is obsolete tomorrow. Same goes with ERP software that is loaded with upgrades and new features almost every day. The ERP software that you purchased for your enterprise must have been advanced tech of its time but as years progressed, the updates stopped, ERP vendors advanced their product technology at a price, overall ERP technology sped at breakneck speed but you chose to continue with the same software. You will need to follow the entire process of ERP selection till its implementation. Download and read our latest whitepaper, ‘An ERP Solution Provider’s Guide for Manufacturers’ that details every step right from ERP selection/evaluation till post implementation.